Cardolite® Ultra LITE 513 is a low viscosity, mono-functional epoxy reactive diluent with Gardner color 1. 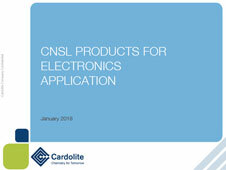 The long hydrophobic aliphatic side chain of cardanol gives this product a very low viscosity and provides excellent water resistance, flexibility, and thermal shock resistance. 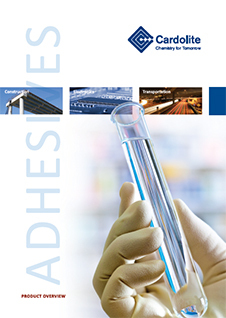 High viscosity solvent or solvent-free formulations can achieve enhanced workability and higher solids without sacrificing other performance properties using this product. 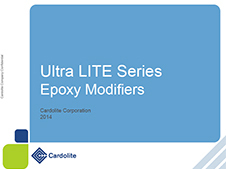 Recommended use level for Cardolite® Ultra LITE 513 is 2-20% of total resin weight. It is an excellent alternative to glycidyl ether diluents because of favorable health hazard labeling, hydrophobicity, and mechanical properties. 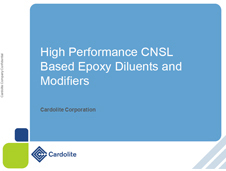 Cardolite® Ultra LITE 513 are used in 1K/2K epoxy adhesives including transportations, industrials and electronics sectors.